2019 Yamaha FX Cruiser HO CONQUER WATER The FX Cruiser HO offers a premium blend of luxury and technology, a reliable 1.8-litre High Output Yamaha marine engine, and RiDETM by Yamaha. Redesigned from the ground up for 2019, this machine offers an unmatched driving experience along with all the features and amenities you need for all-day cruising comfort. ALL-NEW CONNEXT TOUCHSCREEN FX owners now have the power of Connext at their fingertips. 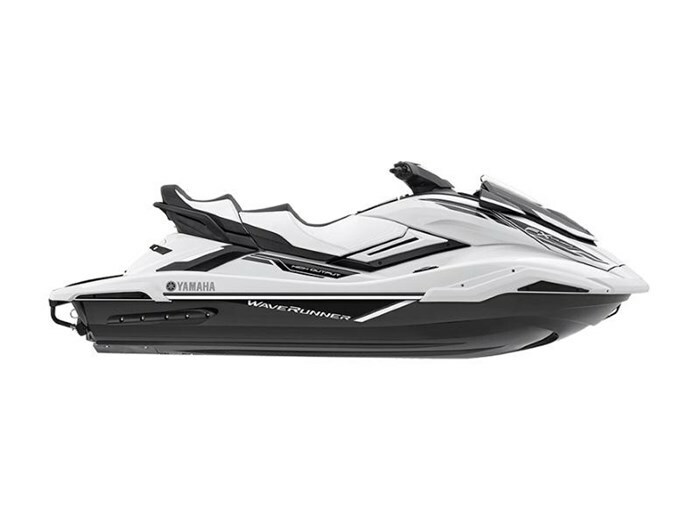 An industry-first touchscreen, Connext serves as the information hub for every aspect of the WaveRunner experience, and provides a suite of functions like security mode, thrust directional enhancer, drive control and more. RIDE TECHNOLOGY The world's first dual handlebar throttle control system is easy and intuitive. Pull the right lever to go forward, and the left lever for reverse. Pull them both, or in any combination, and the system reacts with precise control. NEW MULTI-MOUNT SYSTEM Every model in the FX Series is compatible with an innovative new multi-mount system that allows riders to personalize their ride with accessories like speakers, GPS systems, cameras and more. *Accessories sold separately*. Features may include: THE POWERPLANT The FX Cruiser HO is powered by Yamaha's 1812cc, high output engine which is the largest displacement engine in the PWC industry. This new generation of power balances high performance, economy, environmental awareness and the reliability Yamaha is famous for. Wet Sump Lubrication: Uses two engine oil pumps to deliver lubricated oil to each moving part with water-jacketed sump and oil backflow protection. THE JET PUMP PROPULSION SYSTEM The FX 155mm High Pressure Jet Pump Design could be the most efficient pump configuration ever, increasing stream velocity and thrust while decreasing cavitation and impeller spin. Providing high performance, excellent hook-up and smooth acceleration Stainless Steel 3-blade Impeller and Housing Liner: For superior resistance to wear and long term durability while maintaining accurate clearance tolerances between the impeller and the housing for consistant performance. NANOXCEL HULL & DECK NanoXcel Yamaha's lightweight hull and deck are engineered on a molecular level using nontecnology, a process that buils up thousands of tiny layers of NanoXcel materail. The results is a hull that's not only incredibly strong, but also exceptionally light, comtributing to the impressive power to weight ratio, igle ride and industry-leading fuel economy. Industry-first Footwell Drains: Great for early season riding when the water is cool or clearing standing water when the WaveRunner is not in use.